By Jill Filipovic, Author, "The H-Spot: The Feminist Pursuit of Happiness"
Among the more aggressive efforts to limit abortion are “heartbeat bills,” which functionally outlaw abortion by making the procedure illegal as early as six weeks from a woman’s last period. Most women don’t realize they’re pregnant until they miss a period — by which point they will be running up against the limits of a heartbeat law. By the time they take a pregnancy test and schedule a doctor’s appointment, they are likely to be beyond the date that an abortion would be legal. More than a dozen states have put these laws before their legislatures, even though they are flatly unconstitutional and illegal. Ohio, Mississippi and Kentucky have made them law; Georgia is soon to follow. Because they violate Roe v. Wade, none of these laws are actually in effect. But they are being litigated up the chain, wasting a plethora of resources on what should be settled law. That, though, is the point: To unsettle the law. Just a few years ago, passing legislation that blatantly violated Roe v. Wade was not the anti-abortion movement’s strategy. Instead, anti-abortion groups focused on dismantling abortion rights piece by piece with logical-sounding (though ultimately illogical) legislation that made abortions difficult or impossible to obtain, especially for the most vulnerable women. For example, they passed laws mandating parental consent or notification for an abortion, on the grounds that minors are too immature to decide for themselves to end a pregnancy — never mind that without an abortion, those allegedly too-immature minors would be forced to be parents. They pushed to bar Medicaid and the Affordable Care Act from providing insurance coverage for abortion, which means that women in many states have to pay out-of-pocket for procedures that are typically hundreds of dollars (and can run into the thousands, if they happen later in the pregnancy). As a result, many poor women spend weeks or months squirreling away money, borrowing from family and friends, and pawning valuables to afford a termination that may be growing more expensive by the week. Anti-abortion groups also passed mandatory waiting periods, including multiple visits to the doctor, for what is (or, at least used to be) an exceptionally simple outpatient procedure — another barrier for low-income women who are less likely to have the ability to take so much time off of work, and who carry a heavier burden when they have to pay multiple times for transportation, a clinic visit, and childcare. These waiting periods, as well as the bars on Medicaid and even some insurance program coverage of abortion, have the effect of pushing abortion procedures later and later into pregnancy. Anti-abortion groups and politicians know that, and have used that knowledge to inform their legislative strategy. In states across the nation, they have tried to outlaw abortion after a certain number of weeks, often passing laws that would bar or seriously limit second-trimester procedures. Beyond those legislative efforts, they’ve also made it harder for clinics to provide care by regulating them to a degree that no similar medical facilities face, despite the fact that early abortion is one of the safest procedures around — and that abortion at any stage is safer than childbirth. That was all bad enough. But now, anti-abortion groups have moved into a new era of activism. Previously, there wasn’t much of a point in directly challenging Roe, because it was a non-starter; the votes weren’t there on the Supreme Court to overturn it. The best these groups and their representatives in the Republican Party could hope for was a landscape so hostile to abortion rights that safe, legal procedures were simply out of reach for many women. That much — sadly — they have achieved. And now, thanks to President Trump and the GOP, anti-abortion activists believe they have the majority on the Supreme Court, and that a direct challenge to Roe could end abortion rights as we know them. You see this boldness in some of the more extreme bills introduced in the states, like a recent proposed law in Texas that would have tried women who have abortions for homicide and, as a result, potentially subject them to the death penalty. That bill failed, but it still marks an important moment in anti-abortion activism: So-called “pro-life” politicians actually admitted what they eventually want, which is for the state to punish, incarcerate and potentially kill women who end their pregnancies. There are also some bright spots. After decades of encroachments on the rights to abortion and contraception, pro-choice groups are going on offense. In progressive states, they are pushing to expand abortion access, not just defend it. And they have had some important successes. But for the country as a whole, abortion rights are increasingly imperiled. And there is a direct line from the Trump Supreme Court appointees to these new, brasher attacks. 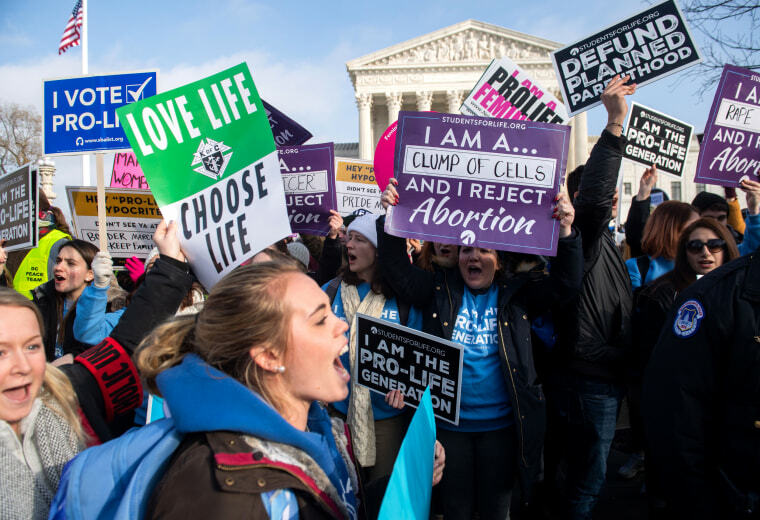 Between the various “heartbeat” laws and the Texas death penalty for abortion bill, anti-abortion organizations and politicians are sending American women a clear message: They’re coming. And the end game isn’t just an end to Roe. It’s women who try to defy that end in prison cells. Jill Filipovic is a journalist and the author of "The H-Spot: The Feminist Pursuit of Happiness."